I had plans for dinner yesterday but time got away from me and I didn’t make it to the shops to get ingredients. A quick nose through the fridge and the cupboards and I saw I had everything to throw this together. It was pretty simple. Fry some smoked bacon and chorizo and put to one side, leaving all the oils from the meat in the pan. Fry some onions, add garlic, celery, grated carrot, tinned tomatoes and a little smoked paprika and leave bubbling away for 30 minutes or so. Meanwhile cook your spaghetti. When it’s ready drain and pour into a serving dish. Pour the tomato sauce over the top and then the bacon and chorizo. 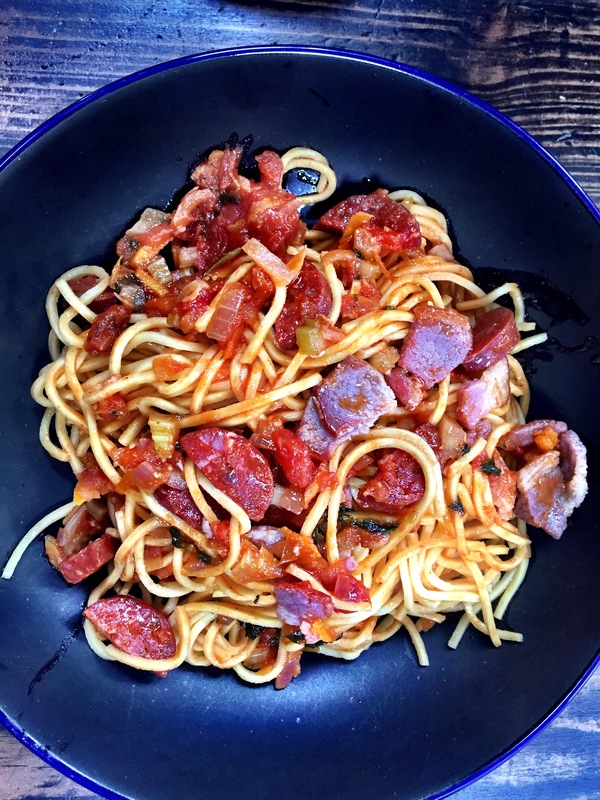 Mix it all together and hey presto – a simple meal from the cupboard. A simple yummy fix me up when you don’t feel like following a recipe from a book.